Victor Exotica Beach Resort - the 'Resort of the Millennium' was launched in December 1999. 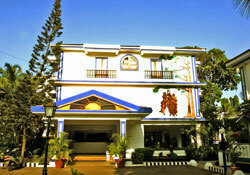 It is located in the heart of the tourism belt of North Goa. Situated a stone's throw away from the hub of all the activities Victor Exotica Beach Resort is just the place you would want to be spending your vacation or host your company's conference. Victor Exotica Beach Resort is a special kind of place where you would love to holiday. A choice of cuisine in a lavish buffet and a la carte menu at our restaurant and poolside bar. Banquet & Conference Facilities, Swimming Pool, Indoor Games - Down Under, Pool Table, Boutique and Ayurvedic Centre. Bowling Ally / Video Game Parlour & Pub. 60 luxurious air-conditioned rooms in the form of 8 room villas.